The first step to recording a bottling in vintrace is to set up the appropriate stock items that will become the placeholder for the stock as inventory. If you plan on recording the packaging directly after setting up the stock item it may be simpler to create a new stock item from the Packaging operation. This will then automatically fill in the bulk wine component for you. As a general rule the first stock item you should create is the bottle. You can use the Inventory – New item option from the menu at the top of vintrace. vintrace will ask what type of item you’re creating – for a single bottle you want to select Single x 1. 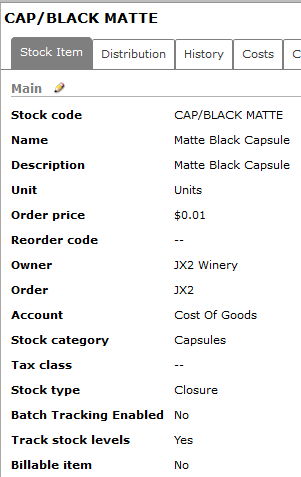 In the new Item screen it’s important to give the new bottle a stock item code inline with your company’s policy. Also ensure that you give it a detailed description and that the owner is set appropriately. 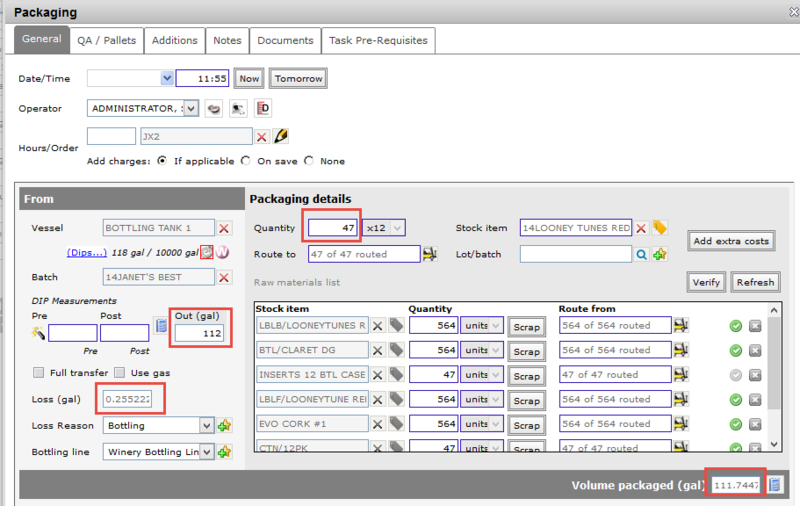 If you are tracking specific lot/batch codes for your bottling runs then ensure the Enable batch tracking option is turned on. For this example, let’s assume we’re using the bottle stock code “14Looney Tunes Red/BTL/750/x1” and description “2014 Looney Tunes Red 750/x1”. The ‘/BTL’ portion of our code indicates that it’s a single bottle – you can make your codes whatever you like but it’s important to make sure you can clearly distinguish between a single bottle, cleanskin (shiner) and a case. Complete the remainder of the left side of the General tab. vintrace does not automatically pull either the tax class nor the alcohol % from the bulk wine; those need to be added manually AND you must have declared the wine as a finished product. If you do not have a recent, measured alcohol reading or you have not declared the bulk wine, you may add them later but they must be in place for the bottling/packaging operation. 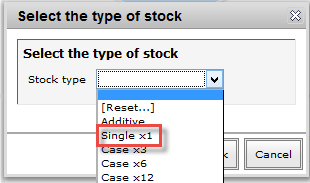 NOTE: If you wish to track batches and/or stock levels, you must check these options before saving. Once set, they can’t be undone; if not set, they can’t be added later. However, it’s entirely up to you what items comprise the bottle and depends on the items you want to track as dry-good inventory. At a minimum you need the bulk wine component. Note: For every dry goods item you list on the Bill of Material, you must have created each component as a stock item. With the exception of the bulk wine (see) below, most of these non-wine stock items will have a quantity of “1”. 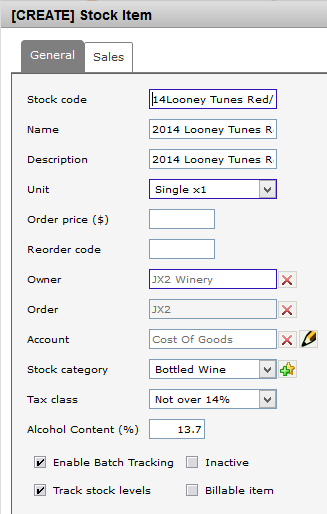 Tip: To select the bulk wine batch enter the batch code into the Stock item field and hit enter or click the search (blue hourglass) option. The search doesn’t show the bulk wine batches by default so you need to untick Hide bulk wine items and then find/select the right wine batch. It will have a /BLK on the end of it after wine batch code. Use the Add line button to add additional lines for your Bill of Materials. When happy with the bottle setup click Save. You now have a bottle that you can package to using the Packaging operation. 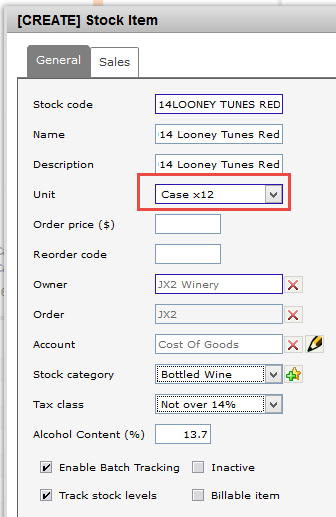 After setting up your single bottle you can setup a case stock item if you’re going straight to case. 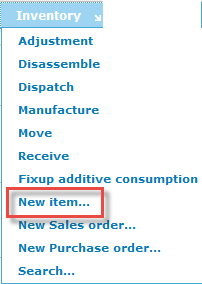 Use the Inventory -> New item option above but this time either select a Case x6 or Case x12 format. You’ll need to give the case it’s own stock code that differentiates it from a single bottle. In keeping with the example above we’ll give our 2014 Looney Tunes Red case a code of “14LOONEY TUNES RED/CS/750/X12″ to indicate that it’s a 12-bottle case. 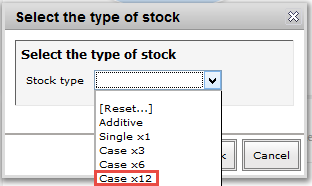 Set the stock type to “case x 12”. Complete the left side of the General tab. Now you are ready to build your BoM for your case. For the BoM you can see that we’ve included 12 x 2014 Looney Tunes Red 750/x1 (our bottles) which as you may guess is building a hierarchy for us. We can now bottle straight to case or straight to bottle. Note: we’ve also included a generic carton and insert (one each for each case). Generally you would have a specific printed carton (use that), but more than likely, you’ll use a generic insert. 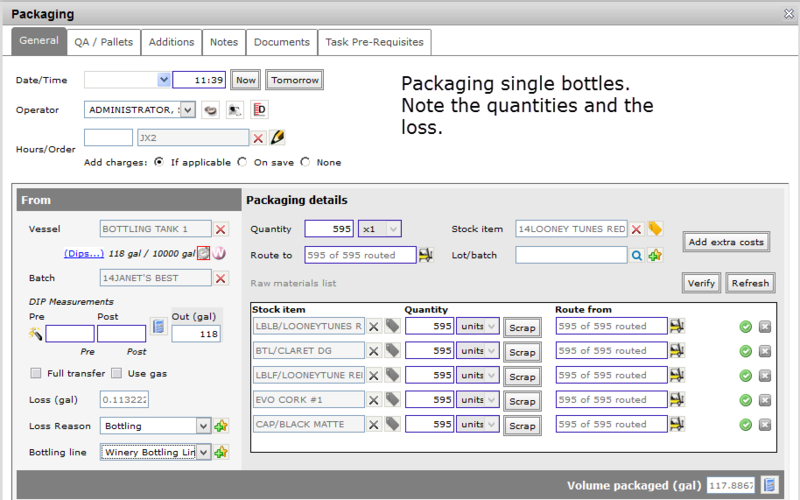 Now that you have your stock items setup you can create a bottling work order. Use the File – New cellar note (work order) option. You’ll need to select Add job to note as per any other work order; choose the Packaging operation. Choose, for each of the non-wine stock items, if required (pink) where to draw the dry good stock from for each of the Route from fields. Choose where to store the bottled wine using the Route to field. Note: using the Calculate button to the right of Volume packaged (gal) is very handy. 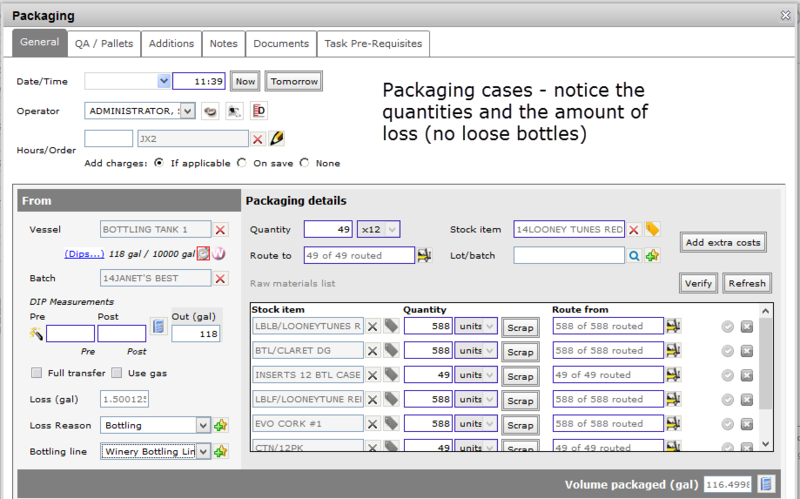 Given the out gallons, the Calculate button will determine how many units can be packaged and any loss/gain. These would be your target figures. Continue reading below about completing a Packaging work order. After setting up your bottling job you’ll notice the work order has a target volume and a target number of units to produce. Obviously the actual should be recorded on the work order along with any other discrepancies. Upon return of the work-order, complete it like any other, being sure to adjust any volumes/quantities actually bottled and accounting for any loss or scrap amounts for dry goods. You can record QA events or Additions using the respective tabs. Bottling more than one tank of the same wine? If bottling more than one tank you can record a separate work order for each of those tanks or, alternatively, transfer all the wine into a large virtual tank called something like Bottling in order to write the one work order. I’ve bottled to cases but have left over bottles to account for? In this instance complete your bottling to cases leaving the balance of the wine in tank. Then record a second bottling to the bottle (x1) stock item for the remainder that’s in tank. This will leave you with most of your wine in inventory in cases with some bottles as well. Your winery management will determine how, if at all, single bottles are tracked. Generally speaking, your “loose” bottles should be 11 or fewer (12 would equal another whole case).